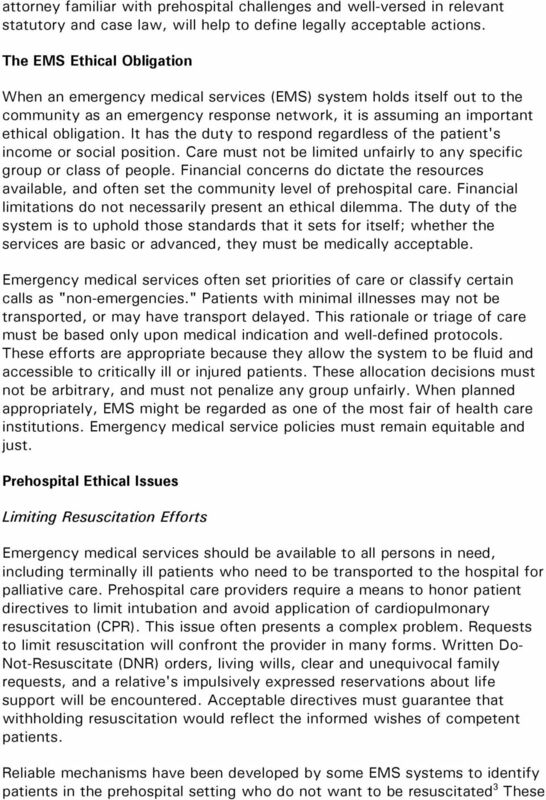 Download "Ethical Challenges in Emergency Medical Services"
7 patient's decision-making ability. The greater the potential harm which could result from refusing care, the greater the decision-making ability that must be demonstrated by the patient. Ideally, rapid judicial determinations of competence should be available. Duty to Provide Care The prehospital arena is unique among medical environments. Must the prehospital providers enter a building where they feel threatened? How should they interact with a dangerous patient? Each system must work out such issues regarding the duty of the prehospital provider. Clear policy can minimize conflict. As one policy is developed, some fundamental ethical principles must be recognized. 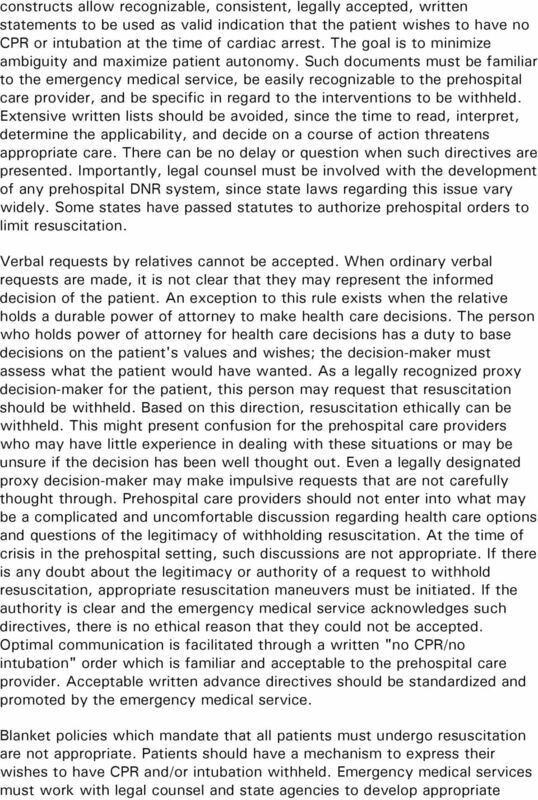 Prehospital care providers have no duty to place themselves at risk in order to care for a patient. There is no responsibility to risk one's own health or safety for the benefit of another. However, dangerous circumstances can be anticipated; when they occur, the support of peace officers should be enlisted. Other duties of the prehospital personnel and the emergency medical service include the obligation to ensure that prehospital personnel are trained to a standard that is consistent and has been accepted by the community. The system must be sure that its units are capable of expeditious and safe response and are equipped appropriately. There is no duty to provide every technology available or the highest-level training for every crew. There is a duty to provide a medically acceptable standard of care and ensure continuing education and quality assurance. The system has a duty to meet the commitments which it undertakes. Confidentially When should the provider speak with the press? Should they speak with police regarding intoxicated patients? Should they ever be concerned about broadcasting names over radio frequencies that can be monitored by the public? Are prehospital care providers appropriately sensitive regarding the confidentiality of patient's medical diagnoses? 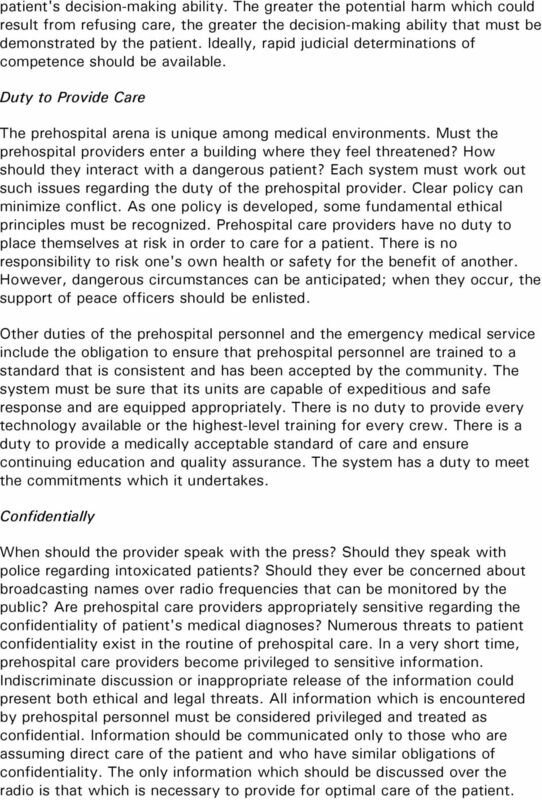 Numerous threats to patient confidentiality exist in the routine of prehospital care. In a very short time, prehospital care providers become privileged to sensitive information. Indiscriminate discussion or inappropriate release of the information could present both ethical and legal threats. All information which is encountered by prehospital personnel must be considered privileged and treated as confidential. Information should be communicated only to those who are assuming direct care of the patient and who have similar obligations of confidentiality. The only information which should be discussed over the radio is that which is necessary to provide for optimal care of the patient. 8 Casual conversations should be avoided with parties uninvolved in the care of patients. Discussion of cases which do not identify the patient and are used for educational purposes present no ethical conflict. Clear policy and appropriate education are important to promote the highest standards of prehospital care. 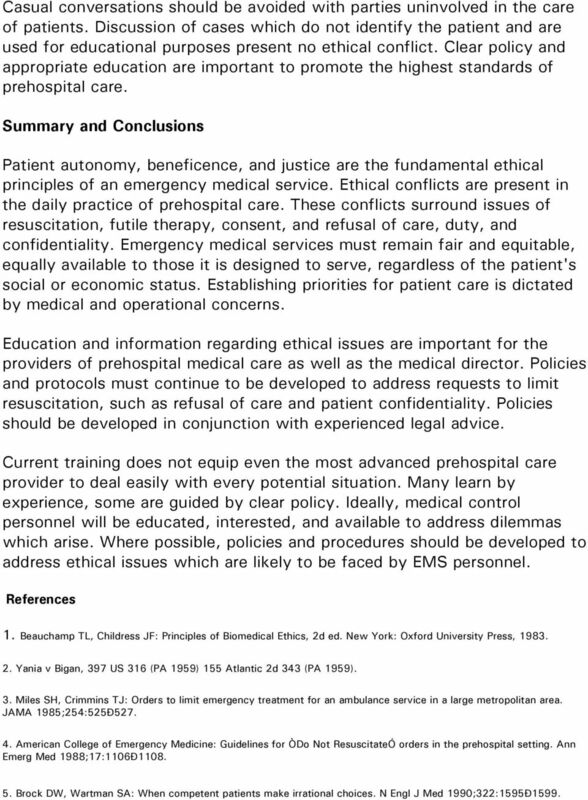 Summary and Conclusions Patient autonomy, beneficence, and justice are the fundamental ethical principles of an emergency medical service. 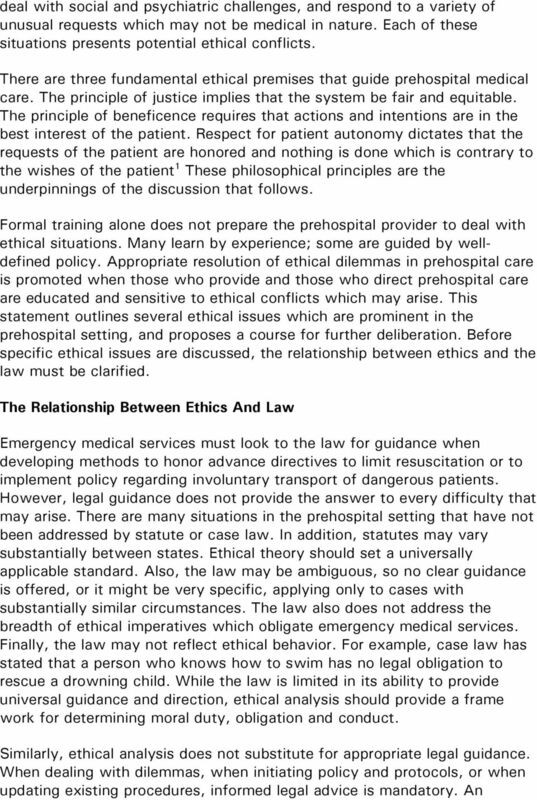 Ethical conflicts are present in the daily practice of prehospital care. These conflicts surround issues of resuscitation, futile therapy, consent, and refusal of care, duty, and confidentiality. Emergency medical services must remain fair and equitable, equally available to those it is designed to serve, regardless of the patient's social or economic status. Establishing priorities for patient care is dictated by medical and operational concerns. Education and information regarding ethical issues are important for the providers of prehospital medical care as well as the medical director. 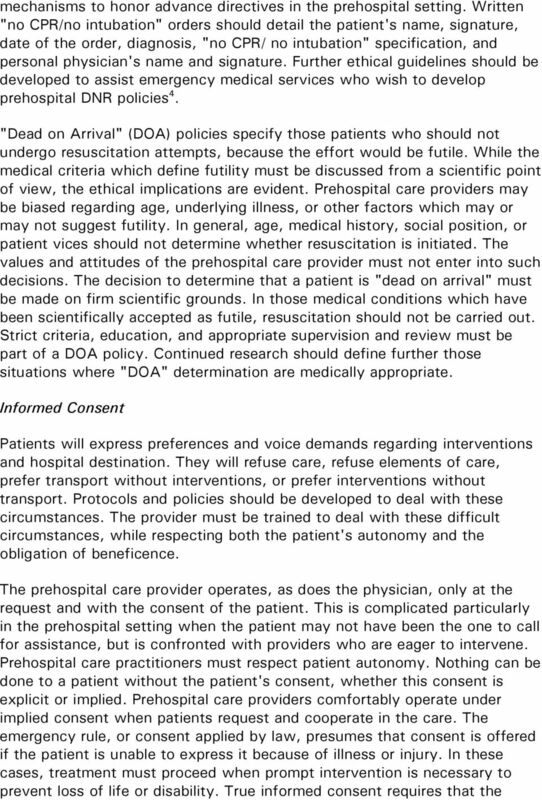 Policies and protocols must continue to be developed to address requests to limit resuscitation, such as refusal of care and patient confidentiality. Policies should be developed in conjunction with experienced legal advice. Current training does not equip even the most advanced prehospital care provider to deal easily with every potential situation. Many learn by experience, some are guided by clear policy. Ideally, medical control personnel will be educated, interested, and available to address dilemmas which arise. Where possible, policies and procedures should be developed to address ethical issues which are likely to be faced by EMS personnel. References 1. Beauchamp TL, Childress JF: Principles of Biomedical Ethics, 2d ed. New York: Oxford University Press, Yania v Bigan, 397 US 316 (PA 1959) 155 Atlantic 2d 343 (PA 1959). 3. 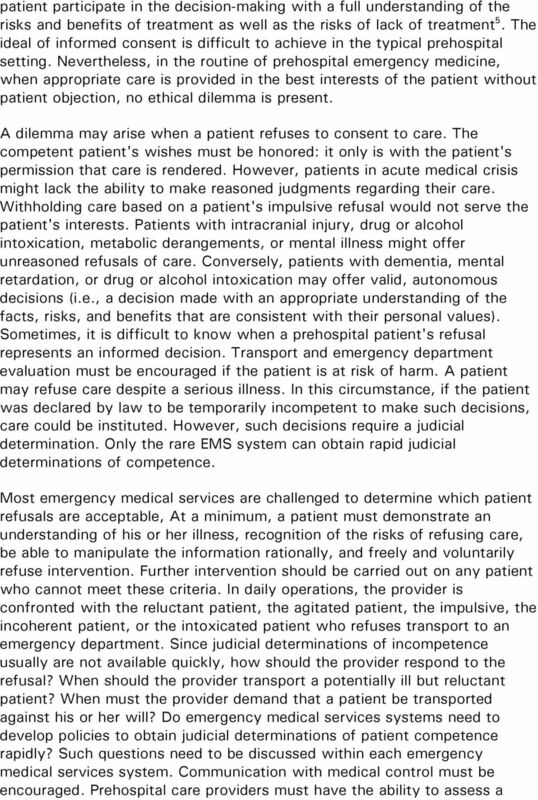 Miles SH, Crimmins TJ: Orders to limit emergency treatment for an ambulance service in a large metropolitan area. 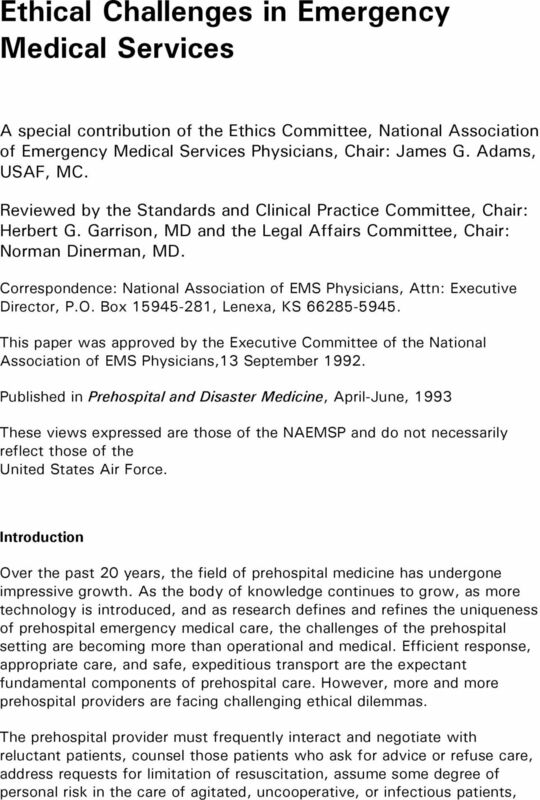 JAMA 1985;254:525Ð American College of Emergency Medicine: Guidelines for ÒDo Not ResuscitateÓ orders in the prehospital setting. Ann Emerg Med 1988;17:1106Ð Brock DW, Wartman SA: When competent patients make irrational choices. N Engl J Med 1990;322:1595Ð1599. ADVANCE DIRECTIVES Jeanne M. Born, RN, JD 26 MARCH 2015 JBorn@nexsenpruet.com This presentation was drafted to present as an educational offering to the staff and is not to be considered legal advice. General Instructions for the Legal Requirements Checklists for Adult Patients and Glossary The MOLST form is a medical order form that tells others the patient s medical orders for lifesustaining treatment. 2. Five years post-graduate degree experience with child custody issues that may include evaluations, therapy, and mediation. Dale C. Godby, Ph.D., ABPP, CGP 6330 LBJ Suite 150 Dallas, Texas 75240 972-233-0648 Problems in love and work, as well as troubling symptoms like depression and anxiety, often lead people to seek therapy.